What groups were you MOST INTERESTED (and ABLE) to do? This interest or skill area doesn’t only mean being able to paint, sculpt or make crafts. You may also have an interest, or ability, in music, drama, writing or visual appreciation, or have other talents (in expression or performance). Also, you may be creative in a more general way. 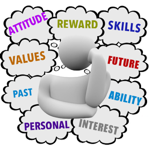 Such as – thinking of different ways to look at or solve a problem. You may also have an interest in jobs closely related to the arts. These could include jobs in administration, marketing or promotion, which require artistic or creative appreciation. You might be interested in writing reports and letters, or organising, checking and recording information accurately. At higher levels, you might plan, organise and supervise office activities, company programs and other workers. Clerical workers do not necessarily sit at a desk all day long. They may regularly deal with clients and other staff. From time to time you may work out of the office. Some examples here are customs, transport, rural, government and agricultural clerks. You might like to work with numbers, formulae and statistics, and to make calculations, estimations and costings. You may use databases, sample surveys, computers and calculators to collect, investigate and summarise information. Many people in this area have analytical minds. They may also use data to make predictions or forecasts on economic, social, population or other trends. You could be the kind of person who is interested in helping or teaching people. You could be involved in community welfare, education, health care, research or information services. You may also choose to do voluntary work, or help with a project in your spare time. You would normally find it easy to communicate with a wide range of people. Your work might involve discussing issues and influencing people’s behaviour or ideas. You should have good reasoning and listening skills, and be able to make a good impression. People don’t need to be outgoing to have interests in this area. You can be quietly effective. With suitable training and sound knowledge, you could do this work well. You may like to work with words and ideas, possibly in reading, writing or discussion. This may include creating original work, or editing and reviewing (critiquing) other people’s work. You may also enjoy expressing your thoughts and opinions, after seeking information on all aspects of an issue. This area often involves a lot of research. You would like to work with people in preventing, relieving or curing physical and mental injuries, impairments and other medical conditions. You may either work directly with patients or be involved in administration, research, education, or a combination of these. Some people feel they don’t have an interest in this area because of a fear of blood or operations, but there are a number of other jobs in this field. You might like to work out in the open and move about, often working from and reporting back to a central location such as a depot, office or station. Some of the industries offering outdoor work are building and construction, agriculture, mining, transport, and security. Many so-called ‘indoor’ jobs may also involve some outdoor work, e.g. community health nurse, architect, rural accountant, biological scientist or real estate agent/salesperson. The amount of time spent outdoors may depend on an employer’s operations or the type of job or location. You might enjoy the kind of work which involves using your hands or tools to prepare, make or repair things. You may prefer more practical tasks where precision and accuracy are often important. This work often includes research and experimentation. You might like to observe, investigate and inquire into scientific or technical processes. This often involves research and experimentation. You will need patience and persistence, particularly for long-term or complicated experiments and observations. You might like to work with tools, equipment or machines. Either in their design, construction, maintenance or use. You would work with technical manuals, blueprints or plans. You would use computers as an aid to design, manufacture or monitoring. You may have a curious nature, wanting to know how and why things work. AGAIN, you should now ask yourself: Do I have any ABILITY to do such things well? Do you have BOTH an INTEREST and an ABILITY in any of these things? That will suggest a group of jobs that you should consider looking more closely at. Because you LIKE doing those type of tasks, and because you have an ABILITY to do them well, you could probably be very successful in those type of jobs. You will need to separately access detailed information about each of the jobs you are interested in. Remember, this is just ONE INDICATOR which can suggest the type of job that may suit you. There are other ways to narrow down your choices as well. You should try some of them if you can. OK… I DID promise it was going to happen… We are now going to take a little detour… And have a look at the JOBS which match these areas! 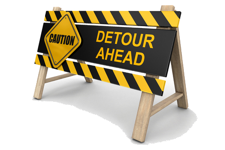 There’s a LOT of stuff here, so I KNOW you will get very sidetracked with this detour! It is VERY IMPORTANT you come back here to continue THIS journey!! !